Development of application front-ends that are designed for deployment on multiple devices requires facilities for specifying deviceindependent semantics. 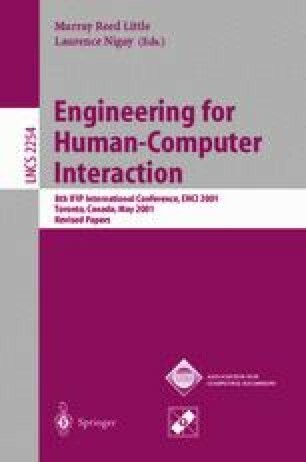 This paper focuses on the user-interface requirements for specifying device-independent layout constraints. We describe a device independent application model, and detail a set of high-level constraints that support automated layout on a wide variety of target platforms. We then focus on the problems that are inherent in any single-view direct-manipulation WYSIWYG interface for specifying such constraints. We propose a two-view interface designed to address those problems, and discuss how this interface effectively meets the requirements of abstract specification for pervasive applications. XSL Transformations (XSLT) Version 1.0, W3C Recommendation 16, November 1999. http://www.w3.org/TR/xslt See also, www.xslt.com.